Update 4/27/17: This flight is now available to book, but be prepared for sky-high fares. The inaugural is scheduled for March 24, 2018 (departing Perth), but the first date we’re seeing business-class availability is March 25. A round-trip economy fare on the inaugural (the only class currently open) will run you a whopping $3,210 AUD (about $2,400). Currently, the lowest business-class fares we’re seeing on this new nonstop total $9,723 AUD (about $7,250). Award seats do not appear to have been loaded. Come March 2018, Qantas will be taking over the record for the world’s longest flight, with nonstop service from Perth (PER) to London (LHR). This will be the first nonstop flight between Australia and Europe. This will be Qantas’ first 787 route, after the airline takes delivery of its first Dreamliner in December 2017. Recently, Qantas revealed layout plans: a premium-heavy 236-passenger aircraft with 42 business seats in a 1-2-1 configuration, 28 premium economy seats in a 2-3-2 configuration and 166 economy seats. The flight will launch in March of 2018, with seats going on sale this coming April. 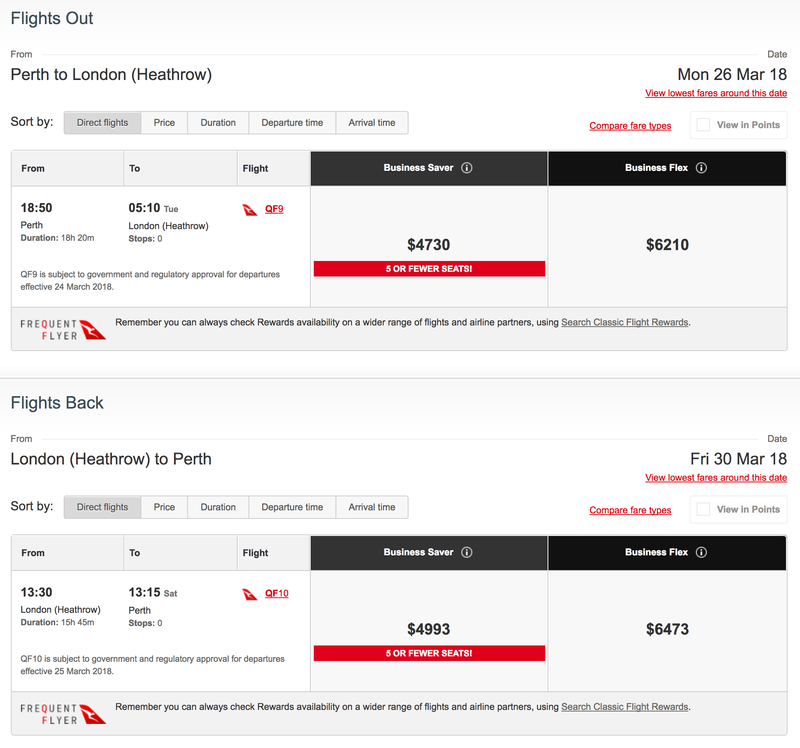 Currently, fares for this route (on flights operated by Emirates) start at just $657 round-trip departing London and $1,074 round-trip departing Perth. It’s likely that Qantas will add a premium, given that all other carriers flying between Europe and Australia require a stop. If it started flying today, this would be the world’s longest flight by great-circle map distance. Currently, the world’s longest flight is DXB to AKL, which clocks in 8,824 miles and about 17 hours and 15 minutes long. Qantas’ flight is more than 9,000 miles one-way: 200 miles and 15 minutes longer, clocking in at 17 and a half hours long. The new longest flight in the world. This new London flight might not be the record holder for long, though — Singapore’s planning to resume nonstop service between New York and Singapore in 2018, and that flight will clock in at more than 9,500 miles each way. We don’t know exactly when the NYC-SIN flight will launch, though, so it’s possible that this Qantas flight will hold the record for at least a few weeks. Additionally, Air India technically broke the record for the world’s longest flight in October, flying 9,389 miles between Delhi and San Francisco, however favorable tailwinds on the transpacific flight brought the flying time down to 14 and a half hours. That flight also tends to alternate routings, so the planned distance is often much shorter. At least you’ll be able to ask for a complimentary wine tasting (even in economy!) to break up some of those long hours. Featured image courtesy of Qantas.